Plain jacket: 41-51cm 3 balls, 51-56cm 4 balls, 56-61cm 5 balls. 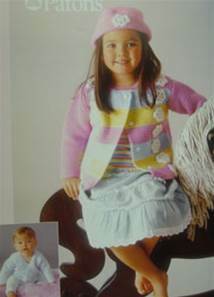 Striped jacket as above except 3 balls main shade 46-51cm, plus 1 ball in each of 3 contrast colours. Hat 1 ball except 56-61cm 2 balls. 50g balls baby DK. Recommended yarn Patons Fairytale DK.